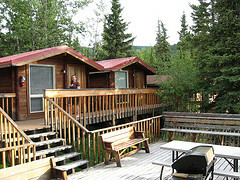 Alaska: Denali Park Accommodation. 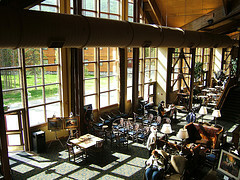 Denali Village Hotels. 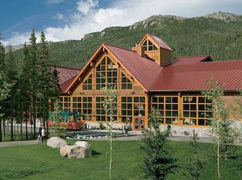 Denali National Park Hotel Reservation. 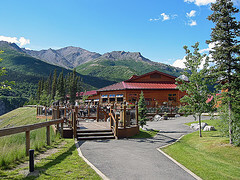 The Denali Princess Lodge is located in the heart of Denali Village, only one mile from the entrance to Denali National Park. The main building, with its 40-foot windows and expansive outdoor decks offer great views of Denali National Park and the Nenana River. It is the ideal location to relax in one of the sunchairs, read a book in front of the two-story rock fireplace or dine in one of the restaurants overlooking Nenana River Canyon. Guests can choose between the King Salmon and Rapids restaurants, which serve breakfast, lunch and dinner. A pizzeria and pub, bistro and dinner theater complete the dining facilities. 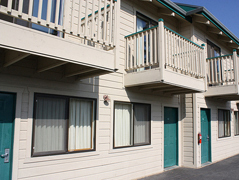 The deluxe riverside lodge features over 660 guest rooms, spread over several low-rise building. Each of the hotel guest rooms is comfortably appointed with two double / queen beds or one king bed, private bath, AC, hair dryer, cable TV and telephone. Outdoor hot tubs afford commanding views of the Park and Nenana River while you relax and indulge in a soothing soak. 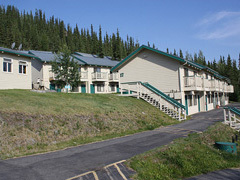 The Denali Bluffs Hotel is located at mile 236.4 of the Parks Highway, close to the entrance of Denali National Park. The 112 guest rooms are located in a series of 12 different buildings which are spread on the slopes of Sugarload Mountain. 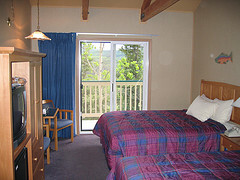 Many of the rooms have a private balcony where you enjoy scenic views of Denali Canyon and the surrounding Alaska Range. The rooms are well appointed with an Alaskan theme and feature 2 double/queen beds or 1 king bed, private bath, satellite TV, telephone, coffee maker and a referigerator. 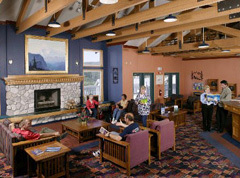 The lodge features a relaxed sitting area with a stone fireplace, gift shop, guest laundry and a courtesy shuttle service. In the evening enjoy a delicious dinner at the Mountaineer Bar & Grill or take a snack from the Perky Moose Cafe. The outside decks are terrific viewing platform for the expansive Denali landscape. It's the place to refuel, refresh and relax in between activities. 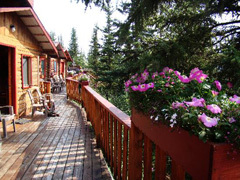 Located 6 miles south of Denali Village, the Denali River Cabins are nestled along the banks of glacial-fed Nenana River. 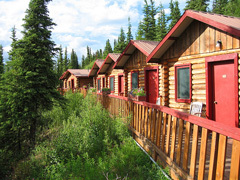 The simple but comfortable cabins are connected by boardwalks and give the feeling of an authentic Alaskan lodging. 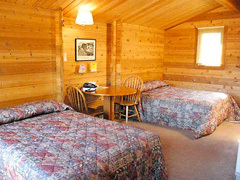 All 54 cedar-wood cabins feature 2 queen/double beds, private bath, heating, TV and telephone. Guests can upgrade to a cabin with full, uninterrupted views of the Nenana River. 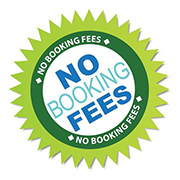 Guests who prefer fully appointed rooms will appreciate the modern Cedars Lodge hotel. The 48 hotel rooms are fully furnished with two double beds, full bath, TV, telephone and coffee pots. A complimentary continental breakfast is available from 5 am - 9am. In the evening enjoy a relaxing drink on one of the riverside sun decks. The Denali Roadhouse Restaurant offers hearty Alaskan cuisine including steaks, seafood, pasta dishes, burgers, salads and a full array of appetizers and lite-fare. Dinner and bar services are available next door at Mt. McKinley Village Lodge, only a short walk from your cabin. After dinner, a stroll beside the river will complete the day. A complimentary shuttle service to the Railroad Depot and Denali Visitor Center is offered. 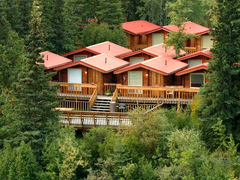 The Crow's Nest Cabins are located at Denali Village, one mile from the entrance to famous Denali National Park. All 39 log cabins are situated high on Sugarloaf Mountain, offering a panoramic view of Nenana River Canyon and the Alaska Range. The cabins are ideal for visitor preferring a quite wilderness setting, yet being only a short (but steep) walk from restaurants and shops. A complimentary shuttle to the railroad station and Denali visitor center is offered. All log cabins offer a spectacular view and are appointed with a Satellite TV, in-room courtesy WiFi, two double beds, private bath and have a cozy sitting area. After a full day of activities you may enjoy a soak in the outdoor hot tub before eating at the Overlook Bar & Grill. The full-service restaurant is a favorite among locals and known for great seafood - Alaskan Halibut & Salmon, steaks and burgers. Guests will find a impeccable wine list and a full selection of Alaskan Brewing Company beers on tap in addition to over 70 varieties of beer. Enjoy the panoramic views from you dining table, the bar or on the sundeck.